Which season is this, anyway? I bought myself a new pair of galoshes. I love that word, galoshes. It brings to mind yellow rubber duckies and chubby kneed toddlers jumping in puddles. Purple umbrellas, rain streaking down window panes, and good books. So I have a new pair. Sleek, navy blue and mid-calf, with a bright orange lining, they are my new favorite shoes. Partly because I get to wear them every day, morning and evening, and sometimes in between. They are made by a company called Hunter, the Rolls Royce of rubber boots. The last pair I had were made by Hunter too, although I cheaped out and bought them slightly used on Ebay. I got what I paid for, by the way. They must have been more than “slightly” used, because they only lasted a few seasons. After a few weeks of doing my chores in wet socks this spring I broke down and bought a new pair directly from the company. And not a moment too soon. The pretty box lined in bright orange with the fancy Hunter logo gave me almost enough gratification to justify the price. At least they are getting a good workout. It’s been a wet summer here in the northeast. Wet and hot. A wet summer following a cold late spring. Following a weird winter. But no one needs me to tell them that the weather is out of whack, all you have to do is look out the window, or better yet look at your garden. I’ve got tomatoes splitting open on the vine before they ripen, peppers dropping all their leaves and huge eggplant bushes with no blooms on them. My carrots are two inches tall and as fat as sausages, the watermelon, winter squash and pumpkins have no fruit at all, and the raspberries mold before I can pick them. I have cabbage spitting open like hatching eggs and basil plants with leaves as brown and slimy as pond scum. Things are composting before I can harvest them. It’s wet. It’s in my nature, sadly, to point out the tragic and flawed first. When someone comes for a tour of the garden, or is just walking through, I’ll delightedly complain about all the garden failures. Maybe it’s my way of deflecting blame, as if I’m somehow responsible for the weather. I need everyone to know that despite all my efforts, things are not perfect, and I recognize it. I make them note the worst so they know that I know the flaws exist. That I’m not proudly displaying what is obviously not the way it should be. It’s a terrible way to behave, and not very self-serving. Most times, not only would they not have recognized the not-perfectness of things, but it robs them of the desired delusion that things really are perfect, and just the way they should be. They leave thinking either I’m a downer, or just not very good at what I do. Or worse, they feel the need to reassure me, and make me feel better for my multitude of failures. Ridiculous. So, now that you’ve heard the worst, both practically and subconsciously, I’ll tell you the good news. Onions the size of softballs. Leeks that are three feet tall. Abundant parsley, mint that is overflowing (isn’t it always) and cucumbers that just keep coming. The garlic harvest was successful, fat white and purple heads drying on racks in the garage. The kohlrabi, while a bit tough on the outside, was none the less plump and crunchy. And the summer squash. Oh, the summer squash. I’m reminded of Barbara Kingsolver’s book Animal Vegetable Miracle where she informs her children that they lock the car doors in summer not to deter someone from stealing the car, but to prevent neighbors from dropping off bags of calf sized zucchini on their back seat. Lock your doors folks, it’s that kind of year. And I can’t forget the flowers. Almost everything was abundant, tall, vibrant and with enormous blooms. My ‘Dinner Plate’ dahlias are actually the size of dinner plates. It’s the best year I’ve seen for poppies, and the Sunflowers are 10 feet tall. Of course the weeds are 10 feet tall too. Some of the grasses growing in my flower beds have become ornamental. I’m trying to go with it and resist loudly declaiming to whomever will listen that I didn’t plant it there, and I haven’t gotten around to pulling it out yet, and if it weren’t for all this blasted rain you wouldn’t notice it. I’ll let out a little secret. We harvested about 6 gallons of honey from our two hives last week. This is big news for all the folks to whom we give honey as a Christmas gift. While a few of them no doubt have jars of honey stacked in the back of the pantry, I know for a fact the majority can’t wait for their Christmas bag of goodies from the Winter Pantry, the honey being the golden prize. 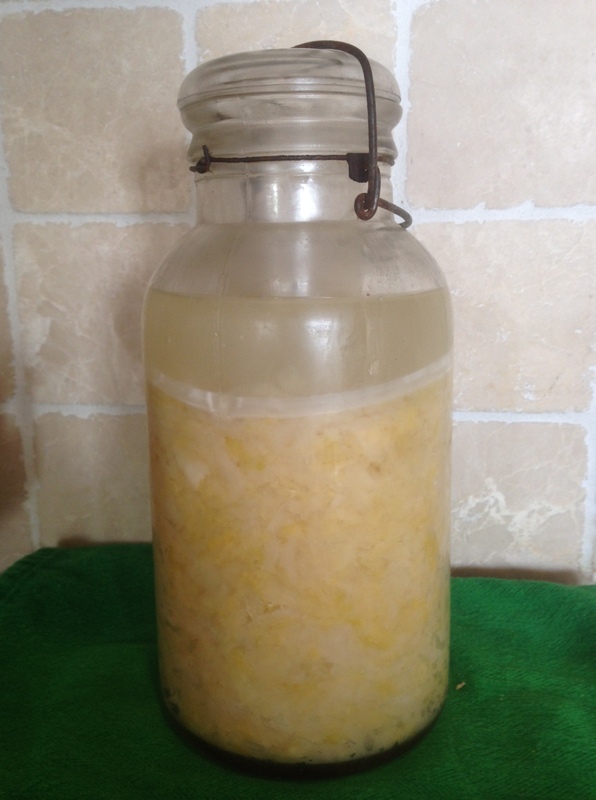 This years honey was pale, golden and sugary, redolent of clover blossoms, honeysuckle and apple. Much different from previous years, when we’ve seen honey that has been almost molasses-like, dark amber and thick. The weather makes a difference for the bees, too. Not being a bee person didn’t stop me from helping this year. Helping is a misnomer, really, but I was there, standing several yards away and trying to breathe deeply and radiate calm normality. As if that’s my natural state. Ha. Only once did I do what I had promised myself not to; shreek, hop, and swat hysterically at my hair in an attempt to dislodge one furious lady trying in vain to defend her home. Of course my husband, who is a bee person and for whom calm normality is a way of life, came to my rescue, and plucked the poor thing from my head before she could sting me and ruin both our lives. He had repeatedly picked the angry things off his arms and neck without a peep, lifting out the heavily laden frames with calm aplomb. Different nature, I guess. And I must mention the fruit. The abundant rain and humid weather has certainly been a blessing for all the fruit setting plants. Fat yellow plums are dripping off our diminutive trees and for some strange reason the birds haven’t yet discovered them. Perhaps they are thrown off by the color? It is wonderful to harvest so many unblemished fruits. The downside being that they don’t spoil as fast, so I’m disinclined to make jam, or even to freeze them. Sorry friends, no plum jam in the Christmas bag. Instead they sit in big bowls on the counter and get gobbled down five at a time. This time of year it’s not unlikely for me to make an entire meal of plums, blueberries and peaches while I stand at the counter dripping juice on myself. Elegant. Conclusion? The weather is weird. It’s different than last year, different than any other year before. Science says it’s going to get weirder. But nature will win out, in the end, I think. And us gardeners, what can we do in the meantime? We have to deal with what we get, acknowledge the bad and celebrate the good, and then go forth and try to be more responsible to the planet. We plant and harvest and eat, we fail and succeed and mostly do the best we can. It’s in our nature. Summer’s heat is upon us, with temperatures climbing towards the 90’s, and with the heat comes the season of the berry. Blueberries and black raspberries are the first out of the gate in early July, changing almost overnight from pale green and rose to deep blue and black, respectively. Wild black raspberries are one of my favorite summer treats. Of all the things I forage for in the wild, these luscious gems are a truly one of my favorites. Sweet yet tart, they are best eaten right away, or as soon as you can get them home and into a bowl of cream. They are very delicate and don’t hold up well to storage, unless you plan to freeze them. If you intend to make anything other than jam with the frozen ones, it’s best to freeze them in a single layer on a sheet. Otherwise they will end up as juice in a bag. Picking black raspberries is no picnic, as they say, and this is one treat you have to work for. They mostly grow along hedgerows and by the sides of dirt roads, and are often laced with stinging nettle and Multi-flora rose brambles, neither of which feels good on bare skin. They like shade and the first ones to ripen are often under other plants. Plan your berry picking foray to include boots and long pants, as well as a wide brimmed hat to protect against the ever present gnats. A long sleeved shirt and some bug repellent go a long way toward making it a pleasant experience. Berries ripen over time, so if you want any quantity for jam or jelly, plan on picking every two days while they are in season. Picking fresh blueberries is somewhat easier, especially if you have a well tended patch, as we do. I was just in the nick of time in getting mine covered against the birds this summer, as the day after I put up the netting they began to turn blue. Experience has taught me that the berries I deem to be “almost ripe” are perfectly edible to the host of birds hovering just over my shoulder waiting for me to leave. We have lost entire crops of the succulent morsels by waiting one too many days to put up the nets. The protective tent only helps so much though; almost every day I shoo out a hungry fellow that has managed to find a hole or sneak under. Blueberries are very easy to maintain. They don’t require spraying and are not bothered by pests. They need little pruning and seem to winter well. We have not had any problems with the deer eating them. Harvest seems to depend more on the weather than any other factor and this year they are ripening early. Ours have grown slowly over time, but are abundant producers and we average about 5 gallons a year from 10 bushes. Pie, and more pie, is our first choice for stored berries, especially in the winter months. They freeze well, but I can’t tell you how long they keep because they don’t last long! Berries are one of natures super-foods, and wild berries even more so. Packed with antioxidants, vitamins and fiber, they not only taste delicious but are really good for you. Everyone should save a spot in their garden for a blueberry bush or two, and if you don’t have a garden, try growing them in pots. It’s well worth the effort, for your taste buds as well as your health. As many of you know, we have the luxury of having a family home on Martha’s Vineyard. We are able to go out to the Island a few times each year and enjoy the company of family and spend some time at the beach. One of our favorite pastimes (read obsessions) is ocean fishing, and Martha’s Vineyard is truly a fisherman’s paradise. No matter what time of year, there is always something good to be had from the ocean. My husband’s parents, who are able to spend quite a bit of time here, also keep a large kitchen garden, so summertime on the island is a time of plenty. The first day I woke to a beautiful balmy island morning and took my coffee into the back yard to check out the garden. My mother in Law had emailed me about what was growing, so I had an idea of what I’d find. What took me by surprise were the giant radishes the size of lemons. I had never seen a radish grow so big. 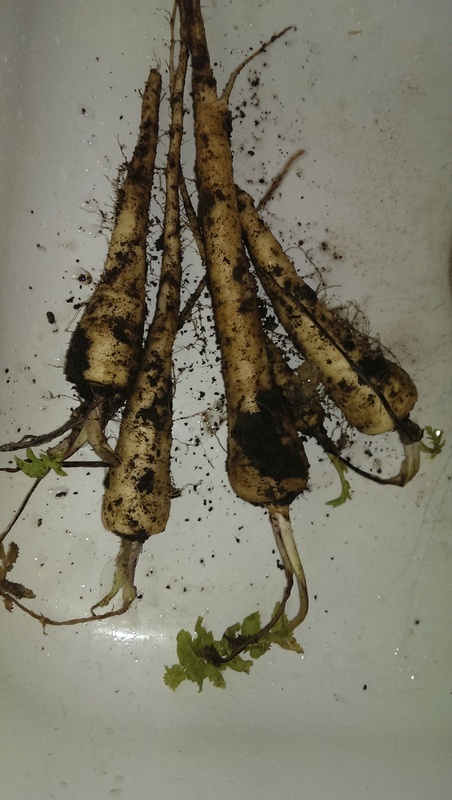 I had planted these very seeds when we last were here in May, in a mix with carrot seeds, but they were average, “garden variety” radish, not some monster varietal. 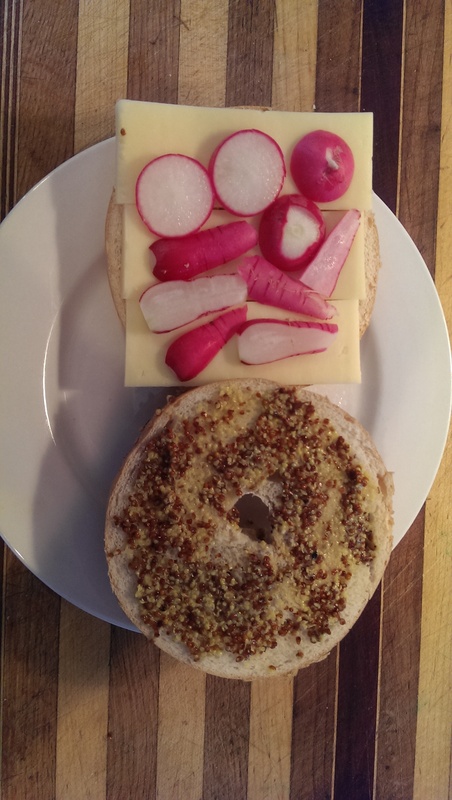 You might remember in my last post a photo of a cheese and radish sandwich on a bagel. 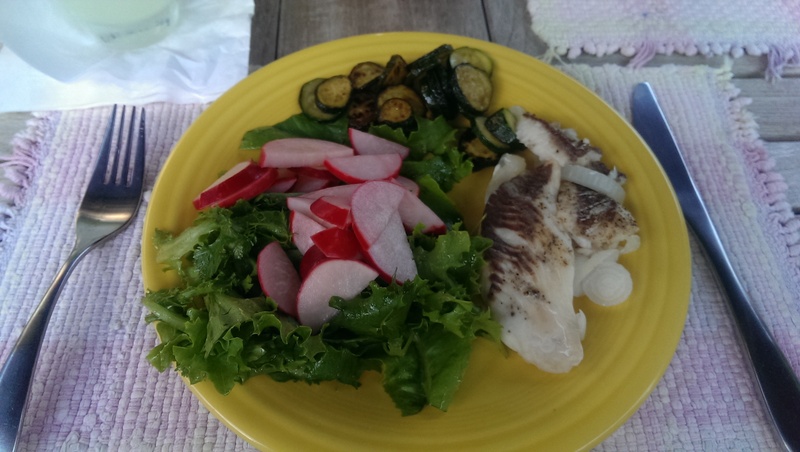 Those tiny radish were from my garden, of which I was formerly proud. What am I doing wrong? I’ii have to do some research to find out why in my garden they are quarter sized and often woody, but here they are luscious red orbs of crunchy delight. I picked a dozen, sliced them thinly, and set them in a marinade of rice wine vinegar, sugar and water. Despite the neat rows of sorrel, arugula, chicory, and red and green lettuce in the garden, I still felt the need to traipse next door with my basket to the twice weekly farmers market. I wanted some cilantro, and that was as good an excuse as any to stroll the aisles of farm raised produce, meats, breads and cheeses, as well as handmade soaps, hats and fresh squeezed lemonade. I was surprised to see the amount and variety this time of year; while my zucchini are just flowering, I found some beautiful 6 inch long ones perfect for the saute pan. When I asked, I was told they grow them under plastic to keep them warm and to fruit earlier. I fought down my rising jealousy with the fact that I live in a different growing zone entirely than Martha’s Vineyard, and furthermore islands are naturally more temperate because of the surrounding seas. 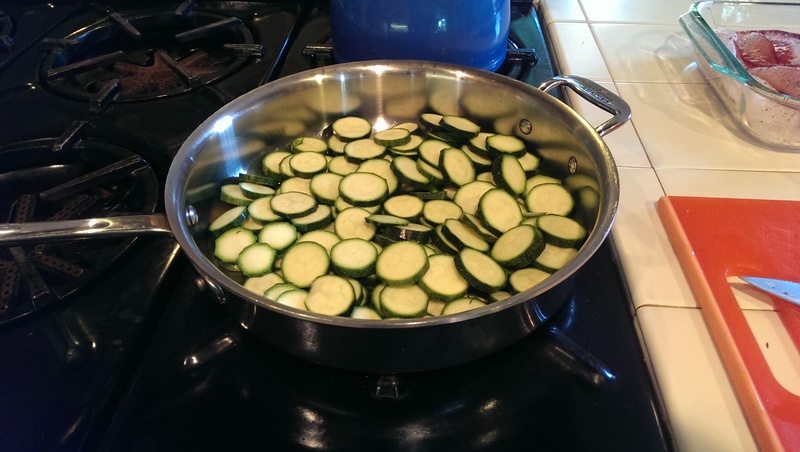 In a month I’d be sick of fresh zucchini anyway. But for now I was happy to have it and bought 8 nice ones to bring home, along with a fresh baguette. Later that afternoon we drove to one of our favorite fishing spots, a jetty that juts out into the sea at the edge of a wide basin, With it’s sister across the way, it forms a channel that feeds a big salt water pond. The structure, as well as the sand beach on one side, provides a great place to fish for black bass, tau-tog, porgy, rock bass, flounder and fluke. It can occasionally be a good spot for stripers and bluefish, but it’s not reliable enough to count on. 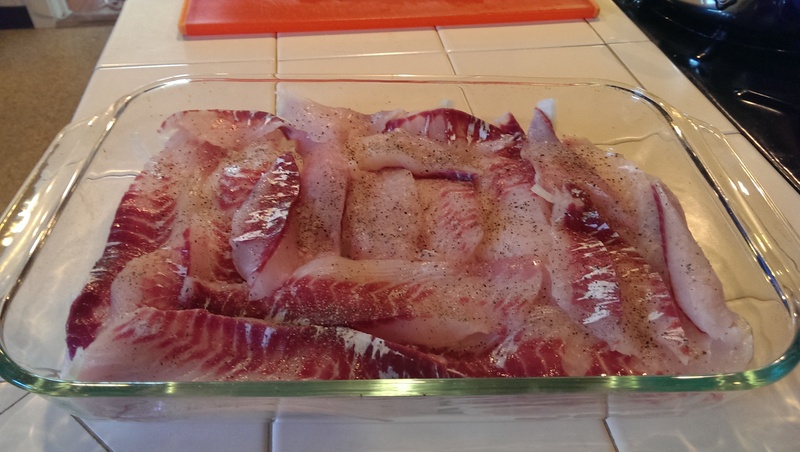 When the water warms it’s a pretty reliable place for scup, and that’s what we went for today. I’m not a big fan of the littler fish, so I usually make my way around the jetty to the channel and try for the odd striper, but midday at a slack tide is not really the ideal time. I didn’t have much hope. After a couple dozen casts, and a nice lunch, I decided walk out to the end of the jetty to see what was going on there. The boys had long since given up fishing and were napping in the sand when I decided the way to catch my striper was to hook on a huge piece of squid, heave it to the middle of the channel and wait till the big one came along and gulped it in. Yeah right. But as I waited, enjoying the warm sun and the breeze off the ocean, I began to notice my line migrate ever so slightly. My big squid was being nibbled! I quickly reeled in, changed my big hook for a smaller one, slapped on a tiny mouthful of squid, cast back out and nailed a giant porgy. I had three more in the bucket before the boys caught on and we had a blitz. We filleted them on the beach and brought them home to bake over sliced onions, one of the easiest and most delicious ways to cook fish. A few minutes in the garden provided me with the greens for a lovely salad. 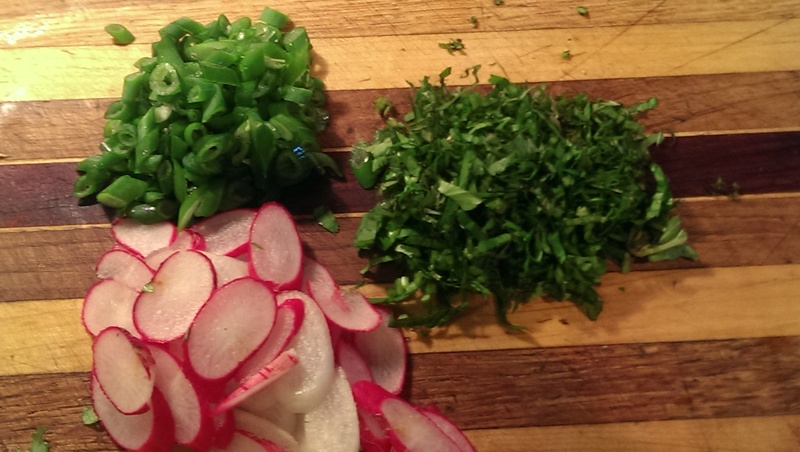 I chopped the fresh cilantro into it and used the radish marinade mixed with some good olive oil for the dressing. The baguette sliced up, the zucchini sliced and sauteed with a pinch of salt and the fish baked to perfection completed our Island feast. A beautiful day and a most memorable meal! Early June in Connecticut is an exciting time for gardeners. By now most things are in the ground that are going in, and all the planning and planting are complete. I usually estimate mid to late may as the time to plant, but after the 15th I keep an eye on the weather and wait for a few days when the night time temperatures stay above 55. Most plants don’t like to root out in the cold. Now in early June the new garden, with its tiny shoots of new growth, is just getting itself established, and it’s too soon to count any success or failures. Those of you who have a greenhouse might be laughing at me, for by now your gardens are lush wonderlands of heavily foliated plants happily bursting with buds and fruit. Sadly, I only have my little bathtub and a grow lamp for starting seeds, and have relegated it to peppers only, so I start most of my vegetables from seeds right in the ground. Another plant I buy already started is eggplant. I have never tried to grow these from seed because I rarely succeed with the plant itself. I have yet to produce a bumper crop of eggplant of any kind, which might be just as well, as I’m the only one in the family who enjoys it. I usually plant just two plants, as I have very limited real estate in my garden, but even with constant attention and words of encouragement, they never seem to thrive. Whether its those damn tiny aphids, blight, rot, or just plain weakness, they always look jaundiced and produce thin tiny fruit. This year, when I saw my two healthy plants begin to yellow, I went to ask advice from a local gardening expert. 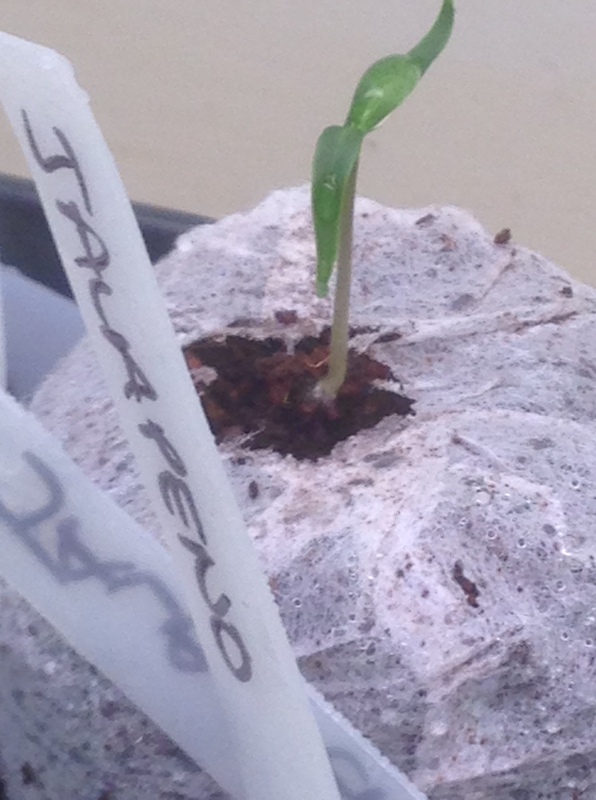 She starts many plants from seed in a greenhouse and sells them to local gardeners like me. I have never bought from her before, but have heard about her renown with plants of all kinds. She is the type who looks at gardening through the eyes of a chemist, while I’m more of a hope and a prayer type. She explained that most people (me) plant eggplant too early, before the soil has warmed sufficiently, and they fail to thrive. She said that most people (me) fail to protect their plants with a copper fungicide dip prior to planting, and that most people (Not me!) over water and leach the nutrients out. She recommended the copper fungicide spray, a natural pesticide with soap in it, and a fish emulsion top dress to enrich the roots. Maybe with these tools, and of course a few good thoughts, I’ll be serving eggplant Parmesan in August! Oh, and she also gave me three varietals of eggplant that she had left over. With five plants in the ground, I almost hope they don’t all thrive, or I’ll be eating eggplant by myself every single night! With everything going in, there is not much coming out this time of year, but that’s not to say there’s nothing to eat in the garden. All my greens are up and we have been feasting on fresh spinach, sorrel, arugula and lettuce for a few weeks. The radishes are full to bursting and the second planting is already coming up. I love radish, and usually plant a spicy blend, with all different shapes and colors. 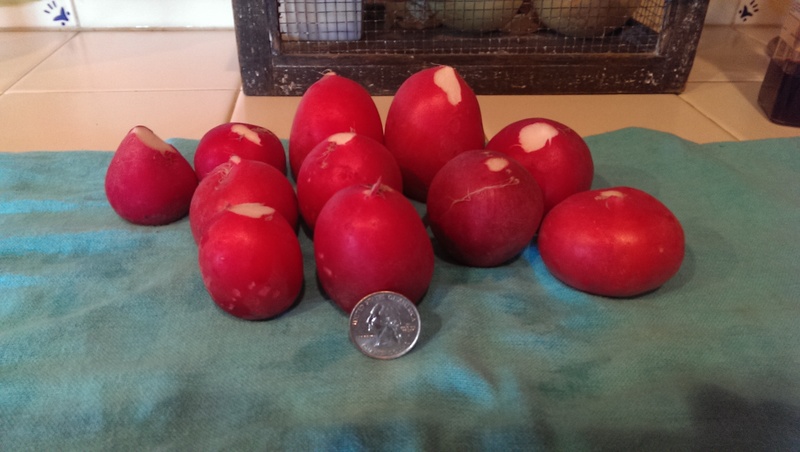 I use radish in a variety of dishes as well as eat them fresh washed out of the dirt. 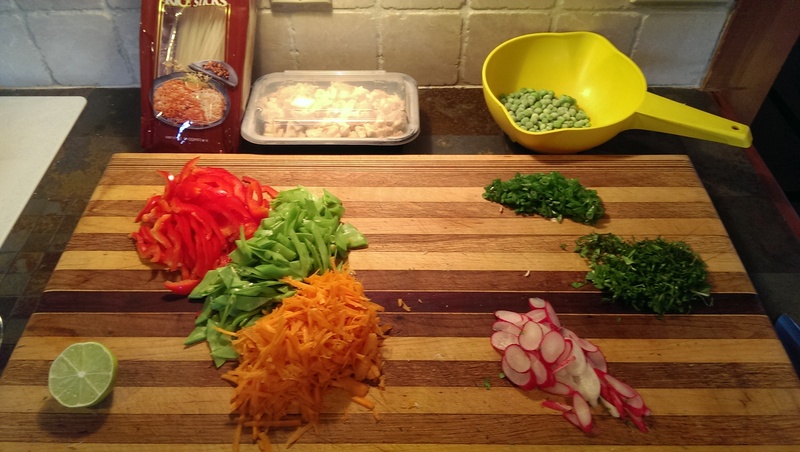 I like the diversity of flavor and color, whether on a salad or sandwich, or stirred into an Asian inspired soup. I made just such a soup the other day. Recipe to follow. 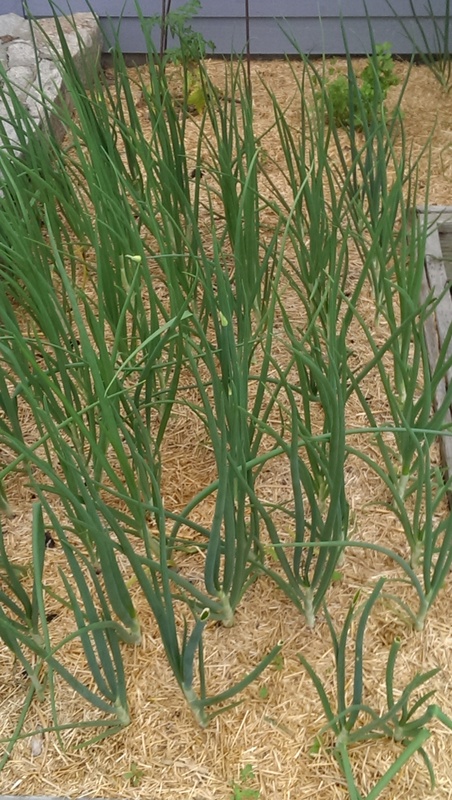 The green onions are ready to be picked, if you can bring yourself to give up a full sized onion later on in the year. I always have a hard time with this. While I’m not a patient person by nature, the thought of yanking out those half formed babies for a quick turn on the grill makes me pause. It’s not that they wouldn’t taste delicious, it’s only that I think of myself trudging to the store in the middle of February to buy some old generic onion instead of plucking one out of the lovely onion basket in the basement, filled with my very own. Instead, I satisfy my taste for fresh onion by snapping off the stems of the onion flowers and chopping or grilling those. They taste just as fine as the whole thing, but I can leave the roots of the onion itself in the ground to fulfill it’s destiny. Aside from the radish, greens and onions, we have been eating lots of cilantro, parsley and basil as those plants establish themselves. The beets are ready to thin and the greens are delicious sauteed or in salads. The strawberries which I transplanted this spring are a bit behind the curve but are beginning to ripen. The peas are blooming and the squash are flowering and the tomatoes continue to make suckers and flower. It’s an exciting time in the garden and lots more to come. 2 cloves garlic chopped fine. Prepare rice noodles as directed on the package. Mix the first 7 ingredients and adjust to taste. Simmer and add the chicken. When noodles are done add the fresh veggies to the soup and simmer for 5 minutes. Be careful not to overcook the vegetables or they will be soggy. Place a serving of rice noodles in a wide bowl and ladle the soup over them. Squeeze the lime over the soup. Serve with chopsticks and extra hot sauce. Enjoy! For those of you mushroom fanatics in the know, and those who desperately wish you were in the know, finding your first morel is about as memorable as your first kiss. Mushroom hunters spend months and years wandering around in dead fall and through mushy forests in search of these precious gems of the spring, and once found, guard the secret of the location like treasure. Many’s the time I have engaged mycological foragers in conversation trying to ferret out information about when, where and how they found these fungal delicacies, and never did I get a hint of a reliable clue. Sure, anyone will give you generalities that you might find in any book on the subject, like look at the edge of the woods near old orchards, or where there are lime deposits, or near dying ash or elm, but disclose their secret spot to an outsider? Never. A few weeks ago my husband came back from hunting turkey with a giant brownish fungi that he imagined I’d find interesting. It was about 5 inches tall, hollow, and had spongy pits all over its “cap”. Although his hunt was unsuccessful, I was much more delighted with his efforts than if he had brought home a fat tom. Little did he expect my shrieks of delight and demands that he take me immediately back to the exact location where he had found it. We agreed to go back and I spent the next half hour poring over my books and through mycology websites to ensure that what he had found was indeed a true morel. I’m sure I’m not the only newby mushroom forager to worry about poisoning my loved ones! In fact it was a real morel, albeit an old one, and off we went to see if there were more. After a short hike through some soggy march and then woodland brambles, we found an old tree with a half dozen large morels under it. Mushroomers say that in order to know mushrooms you must know trees, so I suppose I’m not much of a mushroomer. It’s no wonder I haven’t found any myself. I can’t identify an ash from an elm, so I have no idea what type of tree they were growing under or why. They were easy to find as they stood 5 to 7 inches tall, and were about 2.5 inches wide. Morels are best when young. As they mature they tend to get drier and more brittle, less tender and moist. We decided to give them a try anyway. After picking off a few slugs and a good long soak to drown any other bugs inside, I cut them into chunks for a soup. I decided on a soup for two reasons; they were old, and my sons hate soup. It’s not that I didn’t want to share, it’s just that they might be less likely to try mushroom soup than something like mushrooms in pastry crust, and therefore I had less of a chance of poisoning them if I had somehow made a mistake in my identifications. Did I mention I was nervous to eat them? I sauteed them in some butter and took a nibble. The flavor was surprisingly good for slightly out of date mushrooms. Earthy and pungent and very…mushroomy. I waited a half an hour and didn’t develop stomach cramps so I decided to go ahead. 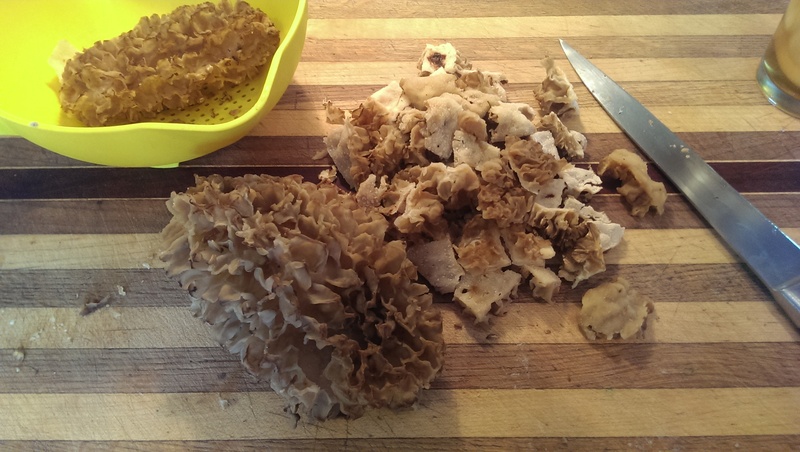 The recipe that follows is a delicious and decadent way to eat a morel. 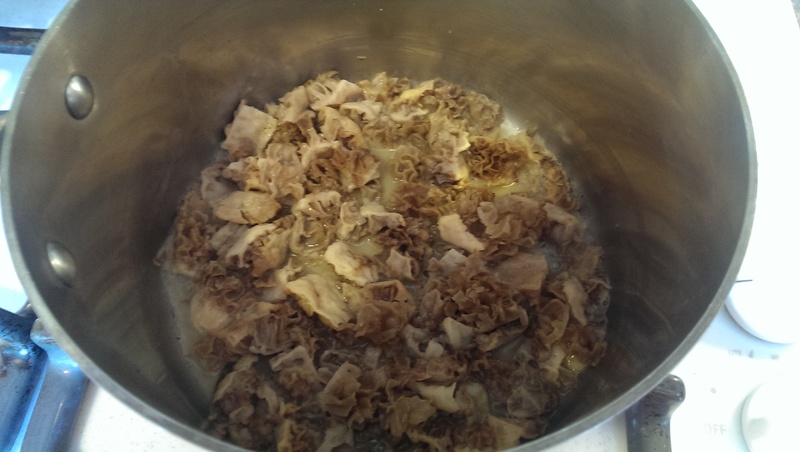 Cut the mushrooms into small pieces and saute over medium heat in the butter until soft and tender, about 5 minutes. Add the flour and stir. Add the broth and stir until smooth. Cook until the broth starts to thicken, about 5 to 10 minutes minutes. Using a handheld puree tool or a blender, mix until smooth. (if you like you can leave some chunks for texture) Add the half and half and the sherry, making sure to keep the heat to a low simmer. Serve topped with the chopped thyme and enjoy! I know it’s been a while since I’ve posted and I have to say it’s not for lack of tasty things to eat over the winter. We feasted on lots of pheasant, venison, fish and veggies, both from the freezer and the pantry. I made late season roasts and stews and pies out of all sorts of yummy things we had put up and stored, but I was too lazy to blog about it. Funny that now, when spring has finally arrived and I have tons of work to do in the garden, I feel myself motivated to post again. 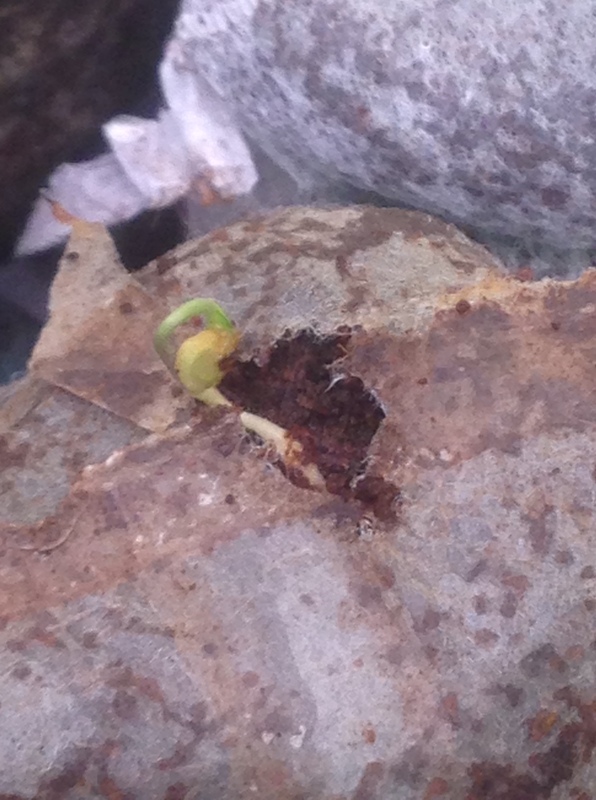 In fact, while I was out surveying my sorry garden boxes last week, and planning big things for this summer, I came upon a bit of green poking out of the last of the snow. Low and behold, sprouting there under the eves where the sun warms the garage wall, I found the last of the parsnips I had left in the ground last fall. I didn’t mean to leave them…they just escaped my attention until it was too late. And so I dug them up! After a good scrub, I removed the inner core of the larger ones (it tends to get woody) cut them into 1″ pieces and roasted them at 400 for about 40 minutes. How sweet and delicious they were! I would even say that they were sweeter for being left in the ground for the long winter than when I originally cooked them in the fall. Their creamy sweetness was a spring treat, and now I know to leave some there for next year. The second treat for me in this season of meager fresh local pickings was a bunch of Jerusalem Artichokes that my son brought home from an expedition. 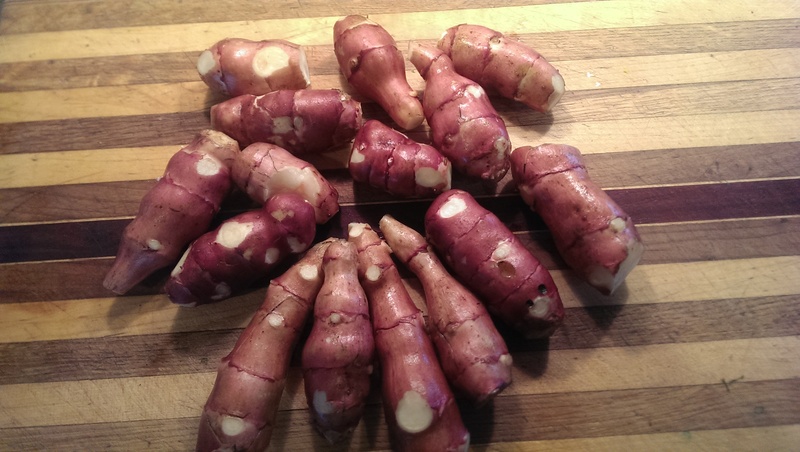 These little tubers are new to me so I did a bit of research on them. Jerusalem artichoke is actually a misnomer, as they are neither related to nor resemble an artichoke. They are actually the roots from a sunflower plant, and sometimes known as sunchokes, a much more appropriate name. They are much like a potato in texture and appearance after removing the little buds that grow on them. They have a soft brown color, although they look reddish in the photo. As for recipes, I learned they are best roasted or sauteed to bring out their distinctly subtle nutty flavor. I plan to slice them into rounds and saute them, in keeping with their origin, in sunflower oil, dress them with sunflower seeds and lemon zest, and add lots of coarse salt and pepper. Stay tuned for the results!